BIG R is your one stop tack and farrier supply center! Whether shoeing one horse or twenty, we'll have the supplies you need. We carry over fifty sizes and styles of horse shoes and nails, as well as wedges and specialized corrective shoes. BIG R's farrier tool selection is based on quality with names like GE, D&S, St.Croix, Cooper, Save-Edge, NC and more! Come and see why so many farriers shop BIG R! 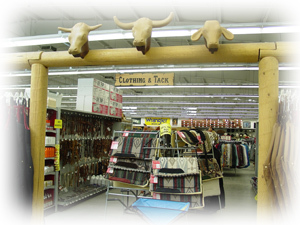 Also visit our Tack department for the largest selection of leather and nylon tack, saddles, and outfitting supplies. With names like Weaver, Equibrand, B Bar B, and Cowboy Leather you can't go wrong! We also carry attachment parts and a large selection of leather care products. Come and see why we horse enthusiasts shop BIG R!